The Union Minister for Finance and Corporate Affairs, Arun Jaitley presented the General Budget 2017-18 in Parliament here today. This is the first of its kind which included the Railway Budget. 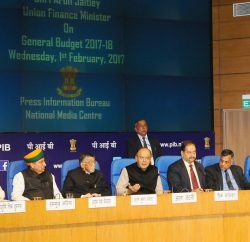 This year’s Union Budget also does not have Plan and Non-plan classifications and has been advanced by a month to the beginning of February. The Finance Minister, in his Budget speech said that the agenda is “Transform, Energise and Clean India” (TEC) – to transform the quality of governance for better quality of life. The aim is to energise various sections of society, especially the youth and the vulnerable and to clean the country from the evils of corruption, black money and non-transparent political funding. He says, the approach is to spend more in rural areas, on infrastructure and poverty alleviation while maintaining fiscal prudence. Economic reforms will be continued promote higher investments and accelerate growth for the benefit of the poor and the underprivileged. Total expenditure in Budget for 2017-18 has been placed at Rs.21.47 lakh crores. Arun Jaitley said that this is expected to have multiplier effects and lead to higher growth. The total resources being transferred to the States and the Union Territories with Legislatures is Rs. 4.11 lakh crores, against Rs.3.60 lakh crores in BE 2016-17. Defence expenditure excluding pensions, is to be Rs. 2,74,114 crores. The Finance Minister said that he has taken into consideration the need for higher public expenditure in the context of sluggish private sector investment and slow global growth. He however said that he had kept in mind the recommendation of the FRBM Committee that a sustainable debt should be the underlying basis of prudent fiscal management. He said that considering aspects in the committee report, the fiscal deficit for 2017-18 has been pegged at 3.2% of GDP. The Minister said that he remains committed to achieve 3% in the following year. Jaitley also asserted that the Revenue Deficit for next year is pegged at 1.9%, against 2% mandated by the FRBM Act. Arun Jaitley announced that the target for agricultural credit in 2017-18 has been fixed at a record level of Rs. 10 lakh crores. A dedicated Micro Irrigation Fund with an initial corpus of Rs.5,000 crores with an objective to achieve the goal, ‘per drop more crop’ besides the Long Term Irrigation Fund with total corpus of this Fund to Rs. 40,000 crores will be set he added. The Finance Minister said that a model law on contract farming would be prepared and circulated among the States for adoption. He also said that Dairy Processing and Infrastructure Development Fund with a corpus of Rs. 8,000 crores over 3 years would be set up in NABARD. Initially, the Fund is to start with a corpus of Rs.2,000 crores. Arun Jaitley announced that the Government will now undertake a Mission Antyodaya to bring one crore households out of poverty and to make 50,000 gram panchayats poverty free by 2019, the year marking the 150th birth anniversary of Gandhiji. He says the strategy is to utilise the existing resources more effectively along with annual increases and a focused micro plan for sustainable livelihood for every deprived household. Under the reoriented MGNREGA to support our resolve to double farmers’ income, about 10 lakh farm ponds are expected to be completed by March 2017 against the targeted 5 lakh farm ponds. This will contribute greatly to drought proofing of gram panchayats. The budgetary provision of Rs.38,500 crores under MGNREGA in 2016-17 has been increased to Rs. 48,000 crores in 2017-18, the highest ever allocation for MGNREGA, the Finance Minster added.. The pace of construction of The Pradhan Mantri Gram Sadak Yojana (PMGSY) has accelerated to reach 133 km roads per day in 2016-17, as against an average of 73 km during the period 2011-2014, Shri Arun Jaitley said that the government is committed to complete the current target under PMGSY by 2019. A sum of Rs. 19,000 crores in 2017-18 for this scheme and together with the contribution of States, an amount of Rs. 27,000 crores is to be spent on PMGSY in 2017-18. An allocation of Rs. 23,000 crores for Pradhan Mantri Awaas Yojana – Gramin from crores is made in 2017-18 against Rs.15,000 in BE 2016-17. Finance Minister said the government proposes to complete 1 crore houses by 2019 for the houseless and those living in kutcha houses. He said the allocation for Prime Minister’s Employment Generation Programme (PMEGP) and credit support schemes has been increased more than 3 times. Arun Jaitley asserted that the total allocation for the rural, agriculture and allied sectors in 2017-18 is Rs.1,87,223 crores, which is 24% higher than the previous year. In the Sector of education and skill development to benefit you several new measures have been announced in this year’s budget. The Pradhan Mantri Kaushal Kendras (PMKK) have presently promoted in more than 60 districts are proposed to be extended to more than 600 districts across the country. A programme called SANKALP – Skill Acquisition and Knowledge Awareness for Livelihood Promotion programme to provide market relevant training to 3.5 crore youth with a budget of Rs. 4,000 crores has been announced. The next phase of Skill Strengthening for Industrial Value Enhancement (STRIVE) is also be launched in 2017-18 at a cost of Rs.2,200 crores to focus on improving the quality and market relevance of vocational training provided in ITIs and strengthen the apprenticeship programmes through industry cluster approach. A National Testing Agency is proposed to be established as an autonomous and self-sustained premier testing organisation to conduct all entrance examinations for higher education institutions in the country. Leveraging Information Technology, a platform called SWAYAM is proposed to be launched to teach at least 350 courses by the best faculty online. This will enable students to virtually, attend the courses taught, access high quality reading resources; participate in discussion forums; take tests and earn academic grades. For higher education reforms in UGC and for secondary education an Innovation Fund to encourage local innovation for ensuring universal access, gender parity and quality improvement with initial focus on 3479 educationally backward blocks are proposed. For schools flexibility in curriculum to promote creativity through local innovative content with emphasis on science education and introduction of a system for measuring annual learning outcomes is proposed. Arun Jaitley announced that Mahila Shakti Kendras will be set-up at village level with an allocation of Rs. 500 crores in 14 lakh ICDS Anganwadi Centres. He said these Kendras are for empowering rural women with opportunities for skill development, employment, digital literacy, health and nutrition. Recalling announcements made by the Prime Minister, the Finance Minister made on 31st December, 2016 as a part of the nationwide scheme Rs. 6,000 each will be transferred directly to the bank accounts of pregnant women who undergo institutional delivery and to vaccinate their children. Budget for the welfare of Women and Children stepped up from Rs. 1,56,528 crores in BE 2016-17 to Rs 1,84,632 crores in 2017-18. As a part of strengthening overall health infrastructure in the country the Finance Minister announced setting up of two new All India Institutes of Medical Sciences in the States of Jharkhand and Gujarat. He said the Government is committed to take necessary steps for structural transformation of the Regulatory framework of Medical Education and Practice in India which includes several steps for increasing post graduate medical seats. The allocation for the welfare of Scheduled Castes has been stepped up from Rs.38,833 crores in BE 2016-17 to Rs.52,393 crores in 2017-18, representing an increase of about 35%. The allocation for Scheduled Tribes has been increased to Rs.31,920 crores and for Minority Affairs to Rs.4,195 crores. The Government will introduce outcome based monitoring of expenditure in these sectors by the NITI Aayog, Arun Jaitley. The Finance Minister asserted that investments in infrastructure sector are in line with the agenda set for this year budget that is to transform the quality of governance for better quality of life to people, to energise various sections of society to enable them to unleash their true potential; and to clean the country from the evils of corruption, black money and non-transparent political funding. The Finance Minister said that accordingly a total allocation of Rs.3, 96,135 crores is made for infrastructure development in 2017-18, out of which Rs. 2, 41,387 crores is for rail, roads, shipping. The total capital and development expenditure on Railways for 2017-18 is to be Rs. 1, 31,000 crores. Out of this Rs.55, 000 crores provided by the Government . Railway lines of 3,500 kms will be commissioned in 2017-18, as against 2,800 kms in 2016-17. A Rashtriya Rail Sanraksha Kosh will be created with a corpus of Rs. 1 lakh crores over a period of 5 years, for passenger safety. Government will lay down clear cut guidelines and timeline for implementing various safety works to be funded from this Kosh. The Finance Minister said that a new Metro Rail Policy will be announced with focus on innovative models of implementation and financing, as well as standardisation and indigenisation of hardware and software. He also said that a new Metro Rail Act will be enacted by rationalising the existing laws to facilitate greater private participation and investment in construction and operation. For the road sector, a Budgetery allocation of Rs. 64,900 crores is made for 2017-18 for highways against Rs. 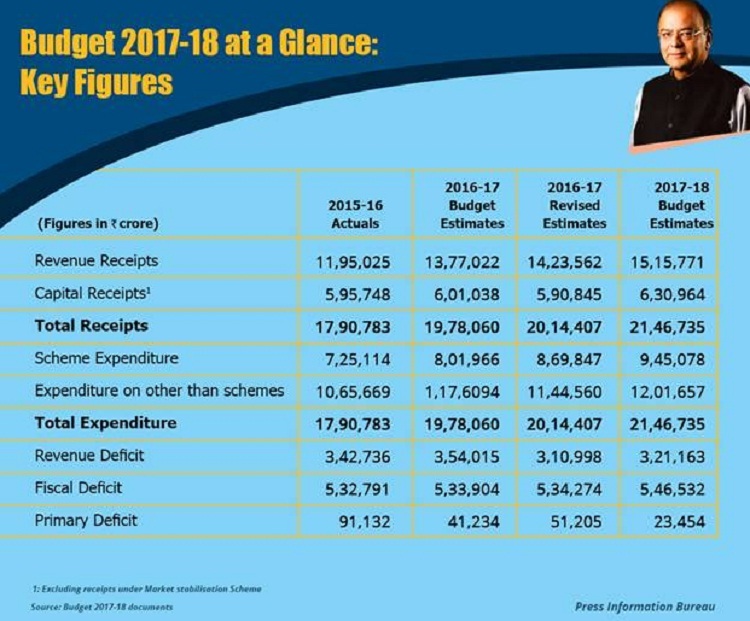 57,976 crores in BE 2016-17. He said 2,000 kms of coastal connectivity roads have been identified for construction and development to facilitate better connectivity with ports and remote villages. Arun Jaitley said that the Airport Authority of India Act will be amended to enable effective monetisation of land assets. The resources, so raised, will be utilised for airport upgradation. The Minister said that select airports in Tier 2 cities will be taken up for operation and maintenance in the PPP mode. The Finance Minister said by the end of 2017-18, high speed broadband connectivity on optical fibre will be available in more than 1,50,000 gram panchayats, with wi-fi hot spots and access to digital services at low tariffs. He said accordingly the budget for Bharat Net Project has been stepped up to Rs.10,000 crores in 2017-18. He pointed out that under the BharatNet Project, OFC has already been laid in 1,55,000 kms. The Minister said that a ‘DigiGaon’ initiative will be launched to provide tele-medicine, education and skills through digital technology. The Minister also talked of strengthening our Energy sector. He said the Government has now decided to take up the second phase of Solar Park development for additional 20,000 MW capacities. Similarly in the second phase the government has decided to set up two more Strategic Crude Oil Reserves one Chandikhole in Odisha and other in Bikaner in Rajasthan besides the three set up earlier. Arun Jaitley announced that a new and restructured Central scheme, namely, Trade Infrastructure for Export Scheme (TIES) will be launched in 2017-18. The Finance Minister has announced that the government has decided to abolish the Foreign Investment Promotion Board (FIPB) in 2017-18. He said that a roadmap for the same will be announced in the next few months. The minister said that this became possible as The Foreign Investment Promotion Board (FIPB) has successfully implemented e-filing and online processing of FDI applications and more than 90% of the total FDI inflows are now through the automatic route. In the meantime, further liberalisation of FDI policy is under consideration and necessary announcements will be made in due course, the minister added. Arun Jaitley asserted that a bill will be introduced in the Parliament to curtail the menace of illicit deposit schemes, after the draft bill, placed in the public domain, has been finalized. He said this is part of this budget’s and the Government’s ‘Clean India’ agenda. The Minister said that an amendment Bill to change the Arbitration and Conciliation Act 1996 will be introduced to streamline institutional arrangements for resolution of disputes in infrastructure related construction contracts, PPP and public utility contracts. The Minister asserted the disinvestment policy announced in the last budget will continue and the Government will put in place a revised mechanism and procedure to ensure time bound listing of identified CPSEs on stock exchanges. Arun Jaitley announced that a Computer Emergency Response Team for our Financial Sector (CERT-Fin) will be established and it will work in close coordination with all financial sector regulators and other stakeholders. 1. The commodities and securities derivative markets will be further integrated by integrating the participants, brokers, and operational frameworks. 2. The process of registration of financial market intermediaries like mutual funds, brokers, portfolio managers, etc. will be made fully online by SEBI to improve ease of doing business. 3. A common application form for registration, opening of bank and demat accounts, and issue of PAN will be introduced for Foreign Portfolio Investors (FPIs). SEBI, RBI and CBDT will jointly put in place the necessary systems and procedures. This will greatly enhance operational flexibility and ease of access to Indian capital markets. 4. Steps will be taken for linking of individual demat accounts with Aadhar. 5. Presently institutions such as banks and insurance companies are categorised as Qualified Institutional Buyers (QIBs) by SEBI. They are eligible for participation in IPOs with specifically earmarked allocations. It is now proposed to allow systemically important NBFCs regulated by RBI and above a certain net worth, to be categorised as QIBs. This will strengthen the IPO market and channelize more investments. 6. Listing and trading of Security Receipts issued by a securitisation company or a reconstruction company under the SARFAESI Act will be permitted in SEBI registered stock exchanges. This will enhance capital flows in to the securitisation industry and will particularly be helpful to deal with bank NPAs. The Finance Minister announced that the Government will put in place a revised mechanism and procedure to ensure time bound listing of identified CPSEs on stock exchanges. He announced that the shares of Railway PSEs like IRCTC, IRFC and IRCON will be listed in stock exchanges. Arun Jaitley said that government also proposes to create an integrated public sector ‘oil major’ which will be able to match the performance of international and domestic private sector oil and gas companies. He said the Government sees possibilities of strengthening our CPSEs through consolidation, mergers and acquisitions. Rs. 10,000 crores for recapitalization of Banks in 2017-18 has been allocated. Additional allocation will be provided, as may be required. The Minister said that Listing and trading of Security Receipts issued by a securitization company or a reconstruction company under the SARFAESI Act will be permitted in SEBI registered stock exchanges. This will enhance capital flows into the securitization industry and will particularly be helpful to deal with bank NPAs. For the Pradhan Mantri Mudra Yojana the lending target has been set at Rs. 2.44 lakh crores in 2017-18, doubling it from the ones in 2015-16 with priority to be given to Dalits, Tribals, Backward Classes, Minorities and Women. The Finance Minister announced that a new ETF with diversified CPSE stocks and other Government holdings will be launched in 2017-18. Arun Jaitley said that India is now on the cusp of a massive digital revolution. He said that earlier initiative of our Government to promote financial inclusion and the JAM trinity were important precursors to our current push for digital transactions. He hoped the BHIM app has launched would unleash the power of mobile phones. The Minister said that Aadhar Pay, a merchant version of Aadhar Enabled Payment System, will be launched shortly to specifically benefit those who do not have debit cards, mobile wallets and mobile phones for digital payments and financial inclusion. The minister said that a Mission will be set up with a target of 2,500 crore digital transactions for 2017-18 through UPI, USSD, Aadhar Pay, IMPS and debit cards. He said there is a proposal to mandate all Government receipts through digital means, beyond a prescribed limit, is under consideration. The minister also pointed out that Necessary amendments are proposed in the Finance Bill 2017 to create a Payments Regulatory Board in the Reserve Bank of India by replacing the existing Board for Regulation and Supervision of Payment and Settlement Systems. Government is also considering the option of amending the Negotiable Instruments Act suitably to ensure that the payees of dishonoured cheques to be able to realise the payments. Government now proposes to utilise the Head Post Offices as front offices for rendering passport services to people in far flung areas. A comprehensive web based interactive Pension Disbursement System for Defence Pensioners will be established to receive pension proposals and make payments centrally. A Centralised Defence Travel System has now been developed through which travel tickets can be booked online by our soldiers and officers. Government is considering introduction of legislative changes, or even a new law, to confiscate the assets within our country of such economic offenders who flee the country, till they submit to the jurisdiction of the appropriate legal forum. The government proposes to rationalise the number of tribunals and merge tribunals wherever appropriate. Recalling that Service to the people was the life-long commitment of the Father of the Nation, Mahatma Gandhi, the Minister said that a High Level Committee under the Chairmanship of the Prime Minister is proposed to be set up to take steps to celebrate the 150th Birth Anniversary of the Mahatma.